Every day we feed our poultry a little grain. Not a lot, because at the same time we move the pens onto new patches of grass, and they eat away at that. The grain bin has made a huge difference in the day. 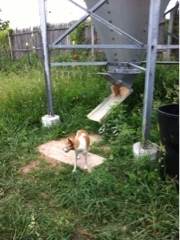 The grain goes into buckets and then into the pens by the scoopful. Done and done. So much simpler. And our backs are happier too!